The Spartanite Executive Twin solved a problem for frequent flyers in the 1960s. They wanted to pack their business papers and overnight clothes in one case. But the did not want their underpants to spill out of it in an important meeting. For this it won a design award. 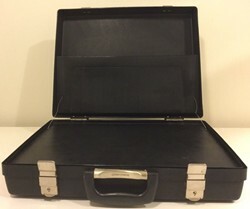 The Spartanite Executive Twin is the most collectable and valuable plastic attaché. But not because of the unique design. In 1971 it became the case for the EMS Synthi AKS. The Synthi was an electronic synthesiser used by music legend Pink Floyd. Spartan Luggage introduced the Spartanite Executive Twin in 1966. It was a case designed for the jet-setting businessman. Frequent travellers had already discovered the joys of baggage reclaim. They wanted a bag that they could carry onto the plane. They stuffed clean shirts, pyjamas, documents and pens all into the one case. The Spartanite Executive Twin made this easy. It had two compartments: one for documents and one for clothes. Spartanite Executive Twin case showing the document compartment. The case was in two halves with a central divider. The divider doubled as a writing surface. In one half of the case was a document holder for travel documents and a pen case. In the other half was a detachable wash bag and a space for clothes. Spartan used moulded polypropelene, a hard plastic, for the case. Polypropelene was a new material for luggage makers. It was first synthesised in 1951, but was only used as a commercial plastic from 1957. Although made of plastic, the Executive Twin was heavy. It weighed 6¾lb. It was also expensive costing 10 guineas (£10 10s or £126 in today's money). The Spartanite Executive Twin was a well-designed and functional case. It solved a real problem of flying in the 1960s. It was listed in the COID Design Index of well-designed British products. In 1971 EMS (Electronic Music Studios (London) Ltd) launched a portable version of their music synthesiser, the VCS3. They found the Spartanite Executive Twin was the ideal size and shape to hold carry it. The new synthesiser was called the EMS Synthi A. Pink Floyd used a later version, the AKS to record 'On the Run' for the 1973 album 'The Dark Side of the Moon'. With that pedigree the Synthi AKS has a huge following with muscians. 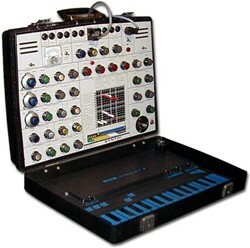 Music fans like to build replicas of the original Synthi and want the original case. So Spartanite Executive Twin cases which were never used to carry Synthis command high prices on eBay. Expect to pay £300 to £400 for a good one. To prevent automated Bots from spamming, please enter the text you see in the image below in the appropriate input box. Your comment will only be submitted if the strings match. Please ensure that your browser supports and accepts cookies, or your comment cannot be verified correctly.